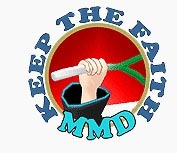 How do I make an MMD music video? What’s the easiest way to make a music video with MikuMikuDance? Where can I download motion files for MMD MikuMikuDance? 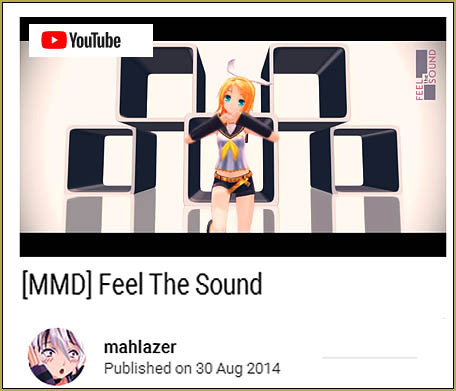 “Feel the Sound” features a motion file by Mahlazer! Fun stuff! … I see that many of the YouTube “Feel the Sound” videos are used to show off an MMDer’s model collection… the models pop in and out as they are replaced with new models who carry-on the dance. For a test of the motion, to see if the motion file has special requirements, I loaded three models. a TDA Neru was to be my modern, complicated model… an original Animasa Rin to which I added a motherbone… and the original Animasa Metal Miku, unmodified. So I figure that Mahlazer’s nice motion file works well on the standard MMD models. Have fun with it! … Download Mahlazer’s RaR folder. It contains one motion file and the WAV file… a 13.1Mb download. I used Bandizip to Extract the RaR folder… I slid the folder into my MMD UserFile folder… Opened MMD, Loaded a model, put that motion file onto the model… loaded the WAV… Pushed Play… and “Bingo!” … a nice little dance, easy as that! … YOU will want to add a stage and some effects… There is plenty of room for creativity as you make this animation your own! Have fun with “Feel the Sound”! Доброго времени! Вы все еще не можете сдвинуть свой сайт с места и начать зарабатывать не плохие деньги? Хочу Вам предложить свою услугу по продвижению вашего сайта в ТОП-10 выдачи Яндекса и Google. Отпишите на электронный ящик письмо с темой “ПРОДВИЖЕНИЕ САЙТОВ В ПОИСКОВИКАХ” и я Вам отвечу. Цена продвижения в 2 раза ниже стоимости СЕО-фирм! I’m glad to inform you that our site has pretty nice standing in Google – certainly nice enough to not need your services as a CEO pusher. Still, I find your offer amusing enough to get a little lax on our usual policy regarding spam posts and keep your message approved on our board (at least, for some while). Maybe *somebody* will be interested in writing you. P.S. Just as you asked, I *did* remove extra ‘=’ characters from the email address you provided in your original message. Have an interesting life! This looks really cute! I noticed in the original video there are a couple of moments where one of the models was doing a move from a point in the video other than the one shown in your motion video. How does the “out of the box” set up look? “Out of the box”… We get motion data for one model. The Rin model uses the motion, unmodified. The other two models also use unmodified motion except I used Center Position Bias to slide their positions left and right of the center stage. … Mahlazer must have modified the motion data for that one model that’s out of sync with the rest of them in his video. Actually, Malazer said she just switched visibility on and off of the models, it’s way easier than video editing. The video description has links.